Do you ever wake up peppy and bounce out of bed Tiggerlike, skip the coffee, dig in the back of the closet for that kicky little skirt, brush your teeth a bit too enthusiastically and splat a glop of toothpaste down the front of the kicky skirt (just as well, since it was, after all, in the back of the closet for a reason), swap it for the clean, more matronly skirt, drag in to the office feeling suddenly elderly, with the start of a caffeine headache—and open a manuscript returned by a writer and find that she is not at all happy and has put “stet” all over your editing because she has completely misunderstood you? Very occasionally when this happens I detect an overly defensive author willfully misinterpreting suggestions in a passive-aggressive way just to make trouble. Most often, however, I’m at fault. My explanations were incomplete or misleading, and now I’m faced with the author’s dismay: “I don’t want footnotes!” “Stet this figure!” “I can’t possibly proofread the whole thing twice!” I have to rush to explain and reassure that the work is not ruined. 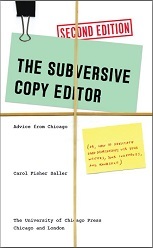 At one point during the production of the Chicago Manual of Style’s 16th edition, I caused alarm by carelessly using the terms “batches” and “rounds” instead of the more accurate “page proofs” and “revised pages” in an e-mail requesting that the typesetters mark all instances of reflow. It took four people about ten e-mails to sort that one out (including Russell Harper being uncharacteristically unhelpful: “I thought batches referred to cookies and rounds to ales”). So here are a few suggestions for preventing confusion and dealing with it when it happens. —Reread your drafts through the eyes of your intended reader. —When a writer believes you are trying to destroy his text, reassure him and apologize, even if you aren’t sure you were at fault. It won’t kill you. Getting defensive will only prolong the resolution, especially if the other person is being obtuse or difficult. —In extreme cases, bake a batch or buy a round. I have never understood why anyone would choose not to combine all the files for a project into a single document rather than copyedit each one separately. The excuse I hear most often, however, is that if something disastrous happens, it’s better for the damage to be confined to a single file. I always wonder what could possibly happen that would be this horrible, and I conclude that the fear must be rooted in old technology—perhaps from the time when it wasn’t possible to undo more than the most recent action. Unless you’re frequently asleep at the wheel, or fail to back up your work at reasonable intervals, your file is safe enough. Editing ten separate documents means repeating the same cleanup routine ten times, for starters. It would be like running the dishwasher one dish at a time. And it slows the editing, which normally depends heavily on searching and replacing. Yes, you can search across separate files—but making the needed replacements is much more efficient within a single document. In fact, when searching for inconsistencies in multiple files is cumbersome, you find yourself doing a lot less of it. And that’s not good editing. One of the funny eccentric-author stories in my office lore involves someone who submitted his book manuscript in more than 350 separate Word files. (It’s true—I was there.) At the bottom of every page he had started a new one. Ridiculous, you’re thinking—but I expect the editor who was assigned that project combined them into ten or twenty files herself. *I’ll grant a temporary pass for (4) while you address those technical difficulties, perhaps by upgrading your computer’s memory or obtaining access to an FTP site that can handle large files. No passes for (3), however; it’s still more efficient to combine the files and break them apart when you’re finished. **When I first combine the files, I insert a manual page break rather than a section break before the next incoming file. If notes or running heads are involved, when I’m finished combining I set up the document’s layout (page numbering, notes numbering, running heads), and only then put section breaks between files. After that, any adjustments to running heads and page numbers will apply only to the section your cursor is in. For note numbers, you can specify “whole document” when you make changes. Bonus Tip 1: Section breaks carry information with them about running heads, etc., so copying and pasting them can save you work if you’re savvy, and cost you work if you aren’t. To my regret, in a lather recently over copyeditors who waste time searching for rules that don’t exist, I failed to acknowledge something important in defense of the offenders: that is, how much credit they deserve for looking up anything at all. Our ignorance is a given. We all have vast deficits, in countless areas of knowledge; that’s no sin. But to challenge, query, or—god forbid—change perfectly good text without making the least effort to check it is one of the great crimes of copyediting. Looking things up is easier than ever before. And not having Internet access is no excuse, at least not for professional editors: If you’re taking money for copyediting and don’t have the right tools, you’re a crook. If you have the tools and don’t use them, you’re a fraud. Last week, Jan Freeman wrote of her surprise that readers would correct her mention of Goober Pyle to Gomer Pyle without checking the facts. Readers of this page regularly question usages without looking up the words first. I love informed queries, and I welcome correction. But here’s a clue for future doubters: I always look up the words I think you’ll challenge. Impulse: Add comma after “bright”? Impulse: I wish I had a donut . . .
With a dictionary and a search engine, you can find most of what you need to know in seconds. Online reference works are easy to find, and some are free. (Katharine O’Moore-Klopf’s KOK Edit site has an excellent list of online editing tools.) What’s difficult is to form the habit of looking things up before you expose yourself as ignorant or lazy. So next time you’re tempted to whinge about some usage or other, stop to look it up. It takes less time to click through your online dictionary than to type a complaint to me. *I tolerated the slight redundancy as a kind of gloss to help other readers; I tolerated the jargon because it suited the book. Do you often find yourself at a party where the person making introductions is unaware of the etiquette whereby you mention a likely mutual interest such as “Carol also has a garden,” or “Carol also has a rotator cuff injury,” or “Carol also loves to watch really bad movies,” and instead says, “Carol’s a copyeditor,” and the person you’re being introduced to backs away saying, “Oh, hello—I just remembered I forgot to turn off the stove”? If the person doesn’t run away, I try to leap right in with a question about his or her interests to prevent what I know will happen otherwise: the peeves list, meant to impress me by how much he or she hates a preposition at the end of a sentence. So here’s a short list of dos and don’ts for talking to copyeditors. To become a popular party person, keep the list handy. Next time you’re introduced, ask your interlocutor to study it before speaking. Let me know how it goes!